Photo: Zachary George (Skokaylem) is pictured with one of the new house posts. A pair of house posts has been unveiled at a wild bird sanctuary next to Tsleil-Waututh’s village as part of a wider push to decolonize the space. 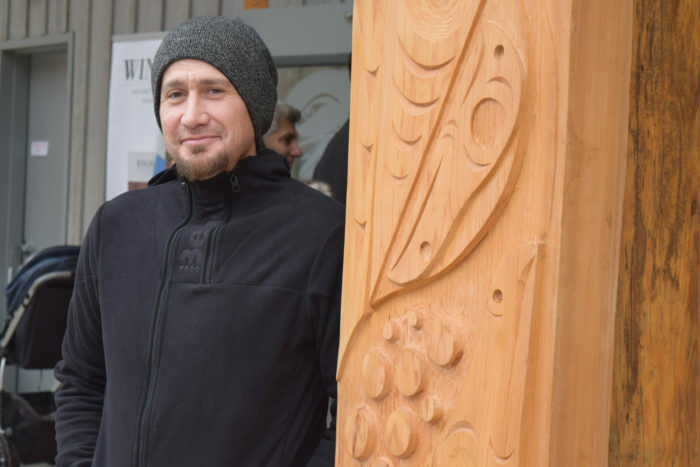 The posts carved by Zachary George (Skokaylem) were revealed at the entrance of the Nature House at Maplewood Flats during a Coast Salish Family Day event on Feb. 18. The 320-acre conservation area is a marshland that was traditionally stewarded by Tsleil-Waututh, but is now managed by the Wild Bird Trust of B.C. George said he was honoured to work on the cedar posts because they will remind Tsleil-Waututh ancestors — and future generations — that the site is theirs. “It’s important to our ancestors, because they see it,” he said. George, who is the son of the late Leonard George, said he recalls playing in Maplewood Flats as a child, climbing trees and running around. He said it is a great honour to now have his work on display at the site. He carved the posts with teachings that he received from his father in mind. One of the posts is carved more ornately while the other is done in a simple style, depicting Tsleil-Waututh ancestors with water spreading out below. “That (post) is the one that’s going to look after this area,” he explained. Wild Bird Trust of B.C. board chairman Irwin Oostindie said directors made a decision about two and a half years ago to formally recognize Tsleil-Waututh as the unceded owners — and original caretakers — of the land. “As an organization we’re doing a critical self-reflection to look at what are we good at and what are we not very good at,” he said. Along with the new posts, there is also artwork on display by Tsleil-Waututh members Ocean Hyland and Jordan Gallie, as well as a piece by James Harry of the Squamish Nation. Oostindie said the Wild Bird Trust of B.C. has committed to shifting its programs by the middle of this year so that at least half are delivered for, and by, Coast Salish people. Over the next 18 months, the board is aiming to reintroduce Coast Salish plants and move towards traditional harvesting of those plants. Staff are also working on plant guides that include the Hul’qumi’num languages and is working on installing interpretive panels on site that talk about the history of the region. Oostindie said it’s just the beginning for the work — he also hopes that Tsleil-Waututh members will start to utilize the area as their own. He hopes to see the Nature House be used as a culture and nature house by the nation and that future generations will recognize it as theirs. “Tsleil-Waututh members … can use the space for free,” he said. More information about the Wild Bird Trust of B.C. and Maplewood Flats can be found at www.wildbirdtrust.org.